In order to become educators, each of us must do our time as students. Slowly, but surely, the student becomes the teacher. Let us hearken back to our days of sitting amongst the members of a classroom, rather than standing boldly in front of them. Imagine you are seated at a terribly uncomfortable, ridiculously tiny, irrationally shaped desk. It probably doesn’t even have enough table surface for you to securely set your laptop. Instead it balances precariously while you try to arrange your limbs into a bearable configuration. Ugh. *Author’s Note: The item and activity in question needn’t be a beach ball. Feel free to substitute in any tired, old team-building activity of your choice, such as Find Someone Who (students chat with their peers to find people who can sign off on certain items listed on handed-out sheets of paper), Memory-style Name Chain games (students say their names and recite the names of all the people who spoke before them), or the ever-popular Plain Old Introductions (students simply go around the room and spout off some information about themselves, such as where they were born or what degrees they’re working towards). These activities may get the job done, but there are many more to choose from that may work better for you and your group. When teaching about sexuality, it is especially important to ensure that your students are at ease and feel safe with one another and with you. An icebreaker or team-building energizer will work wonders. Now, contrary to many student experiences with the often painfully dull cliches of some of the most common icebreakers and energizers, such as those listed above, these activities truly do serve a fantastic purpose when used correctly. In order to use them well, you must consider the timing of the activity and the audience. Should you open with an activity? Close with one? Before or after lunch? Consider how the timing will affect your group. Choose activities that are appropriate to the developmental stage of the learners with which you are working. Many theories about human development exist, including Freud, Erikson, Bandura, Piaget, and many others. Use these theories as your guides when choosing an exercise for your facilitation. For the purposes of this post, we are primarily talking about activities which perform on an interpersonal or individual basis, as opposed to strictly introducing a topic or conveying information. Kolb’s Experiential Learning Theory and Gardner’s Theory of Multiple Intelligences, among others, support the use of icebreakers and energizers to enhance the learning experience. Both of these types of activities serves a different core purpose, although certainly some of them do double duty and there is bound to be some overlap. An icebreaker serves to reduce tension and nerves, helping people become more comfortable with one another. An energizer serves to refresh, refocus, inspire, motivate, and otherwise control the mood of the room in a positive manner. Bear in mind that, while choosing a developmentally appropriate activity suitable for your group or class should be a priority, so should the inclusion of different types of learners. Although these activities are intended simply to get the blood flowing, to lower inhibitions, or to create connections between students, among other things, some activities will still appeal more to certain students than others. Browse through the resources for information and inspiration. If you find something suited to your learners, make use of it. If not, adapt it or create something new! The internet is a treasure trove for the educator seeking new activities to try. A simple keyword search turns up a variety of websites, many of which feature extensive lists of options. Don’t forget to check out social media platforms as well. For example, Youtube, where you can find videos of activities being executed, and Pinterest, where educators have been known to collect ideas and resources on their public pages. Although the internet is a valuable resource, I’ve found that word of mouth works best. Ask fellow educators what sorts of activities they use and find most enjoyable and effective. I have included links to a number of web resources at the end of this post. It is important for us as educators to remember how it felt for us to be students in any variety of settings and circumstances, whether we are teaching kindergarteners or adult learners. You were there on the other side of the desk not so long ago yourself. You have a whole World Wide Web filled with fun activities, just waiting to be used in your classroom. 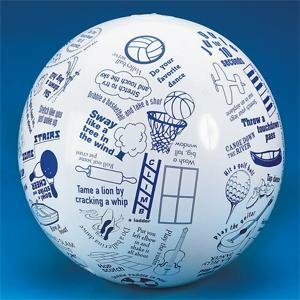 If you still insist on clinging to your beach ball, the Toss’N Talk About Movement Ball by S&S Worldwide is a perfect example of how to get creative with a familiar idea, making it new and exciting and better able to reach your participants! S&S Worldwide has replaced questions with actions in their charming take on the beach ball activity. I must admit I’m not a fan of icebreaker activities. Since I teach adults I always feel like icebreakers are time wasters designed to remind students of the power differential between them and the instructor (you will do this activity whether you want to or not. I will not do the activity and thus be the only one maintaining my dignity). Group coherence and trust is not manufactured via a silly game, but developed over time (and earned). Yes, I am a curmudgeon. However, if an icebreaker is linked to the specifics of the class, then I feel they can work. To offer an example, I asked my Intro to Shakespeare students to define their relationship to Shakespeare as hostile, respectful but distant, friendly or BFFs. They found this funny and it told me a lot about how confident the students were about the class. I also liked the beach ball/Japanese counting in 501 because Dr. Sitron immediately moved into a discussion of how we understand and adapt to a culture that is not interested in pausing to explain itself. So my question is do others also find that icebreakers only work (or work better) when they have made sure the icebreaker is connected explicitly to the work of the class, or am I alone in feeling that is important? To answer Annalisa’s question, I do feel that ice breakers which are not connected to the material being presented can be effective. There are many times when students want to take a breather from the instruction and focus on something that is entirely different and that provides some type of stress relief. Again, there are some people that would disagree and want to focus on ice breakers that focus around the lesson that is being taught and some who dislike ice breakers altogether. I do agree that choosing ice breakers that are developmentally appropriate to your learners will be executed well. The level of instruction for human sexuality needs to be appropriate to the age of the students who are receiving the instruction. In higher ed., the age group can vastly differ while in elem/middle/high school the students are relatively the same age. So students should not always be grouped by chronological age, but rather by developmental ability. Instruction should be geared toward their level, not to their grade/age. As you stated earlier, if the classroom environment is not comfortable or conducive to the student then the student easily become resistant and may shut themselves off before the instructor even begins. I recently attended a conference and the morning ice breaker was called “the bump”. This ice breaker had everyone in the room stand in a large circle and start dancing to the music. When the music stopped, you had to turn to the person next to you, bump your hip with the other person and answer a question. Initially, I was mortified because I did not have a drink to warm me up and at 7am was difficult for me to find my groove. I was not a big fan of this warm-up but there were others around me who loved it! Finding a universal warm-up/ice breaker can be a challenge. The YD network is a great resource that I may use in the future for ice breakers. Really interesting discussion here. I think icebreakers unrelated to course content are inherently useful if they serve the purpose they’re intended for. For instance, it you’re doing a workshop or training on trauma and have been talking about really intense, heavy material, an icebreaker could be useful as a means of transitioning topics, lighten the air, re-energize, etc. In this case, I think a trauma related icebreaker, which just sounds inherently wrong and like an oxymoron, would be contraindicated. However, if the topic of the class, workshop, or training is particularly intense, abstract, or even personal, and icebreaker that relates to the topic could be really great as a conversation starter, as if to say, “It’s time to put your seat backs and tray tables up because we are about to take off.” Sometimes I have received more positive feedback about an icebreaker than about the lesson, which is neither good nor bad. It’s about what people connect to, and how they can access information. I think it was really key for the author to address different learning styles here because it is so important. Someone may be more of a kinesthetic learner, and glean more from an interactive icebreaker than from a lecture. I think it’s important to take into consideration different learning styles with both the icebreaker and the methods used in the lesson. I would love to see more about using icebreakers with small versus large groups. What are some important things to consider with group size, and what are people’s successes and challenges? Great read! Thank you for this! I dread icebreakers, but I know they are really effective at helping me connect with classmates. I often get really anxious at the start of a new class because I am worried about what new torture the instructor has dreamed up next (ha! J/k, Sitron). My anxiety around icebreakers is usually because I am afraid it will be something physical that “outs” me as having different physical abilities than my classmates. I have MD, and it usually is not something I need to disclose up-front in a classroom, because we are all seated and I can show off my big brain instead of my lack of coordination 🙂 But the second I see that stupid beach-ball, or even worse – cushie-balls, my heart sinks. I don’t want the first impression I made on my classmates to be one that highlights my physical differences and makes me feel like a weirdo. 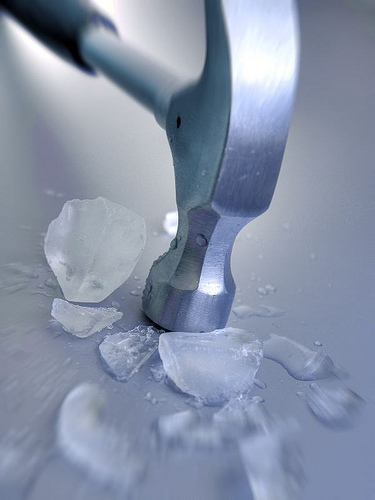 That being said, I think most ice breakers reap far more benefits than we are ever willing to admit, and I was trying to think of a way out of my own personal dilemma…Like, what would be an ice breaker that could include physical activity of some sort, but make it optional for students who are not into it? What I came up with was a classroom-friendly Truth or Dare – each person gets to pick Truth or Dare, depending on what they are comfortable with. The instructor comes prepared with a stack of Truth and Dare cards, and as each person goes around and picks one or the other, the instructor picks a unique card for them. So Truth cards could be anything from “What do you want to be when you grow up” to “What about this course is most anxiety-provoking for you.” Dare cards could be “Show us what’s in your bag” or “Give us your best dance move.” This could allow students to feel more in control, while still opening up and giving interesting and memorable information about themselves. What do you guys think? Would you pick Truth or Dare? Wow, I’m really glad to see everyone’s responses to this post 🙂 Especially everyone sharing about their ideas and experiences with icebreakers. Awesome. Hilary, I really love the truth or dare idea because it allows people who feel really uncomfortable with the more physical challenges to opt out in a discreet way. I definitely think that activities like these can be used to introduce a topic or to relate to course material if that’s the way you want to use them. However, I definitely don’t think that icebreakers/energizers/teambuilders just for their own purpose are any less valid! They’re just another way that we can nudge our learners in the directions we want to take them. Jaymie, I love your question about group size, because it’s something I’m also curious about. Does anyone have any thoughts? Good question about group size and choice of ice breakers Jaymie! I hope someone has an answer or suggestion. The only thing that comes to mind is that for larger groups one can simply split the large group into smaller groups of the right size and run the icebreakers concurrently. I’ve found from past experience that if the ice breakers require quite a bit of movement, feedback or interaction, it is better suited to smaller groups (10-20 maybe?). I always connect ice breakers to the work, even if it’s just that part of the work in the beginning that requires creating a safe and comfortable space for learning and sharing. The activities are selected as part of the whole package and in the same way I would choose a training technique or strategy, thus for me, they are always helpful.